Giovanni Reyna scored the gamewinner for the U.S. U-15 boys national team in a 2-1 final victory over England to lift the Torneo Delle Nazioni title in Italy. Coach Dave Van Den Bergh’s U.S. team beat Portugal, 4-2, in the semifinals. The final was a rematch of the USA’s 3-2 loss to England in group play after it clinched a semifinal spot with wins over Slovenia, 4-0, and Russia, 2-1. Reyna, the son of U.S. Hall of Famer Claudio Reyna, also scored against Slovenia and Russia. Reyna, who plays for NYCFC’s Development Academy team, sat out the England group game. England took a 69th minute lead in the 80-minute final but Joseph Scally, also an NYCFC player, equalized two minutes later. Reyna hit the winner on breakaway in the 77th minute. Alfonso Ocampo Chavez (Seattle Sounders) scored twice in the semifinal win over Portugal. Goals: Scally 69, Reyna 77; Rogers 66. USA — Las, Alejandre, Bello, Busio, Fuentes, Gaines, Nielsen, Reyna, Saldana, Scally, Stroud (Atencio). England — Moulden, Robinson (Bellis), Hodge (Pendlebury), Pennant (Madueke), Rogers, Livramento (Simeu), Osorio (Palmer), Mighten (Gelhardt), Dorsett (Cover), Gordon, Musah. MIDFIELDERS (5): Julian Anderson (Philadelphia Union; Ocean, N.J.), Josh Atencio (Seattle Sounders; Seattle, Wash.), Gilbert Fuentes (San Jose Earthquakes; Tracy, Calif.), Adam Saldana (Real So Cal; Panorama City, Calif.), Peter Stroud (NYRB; Chester, N.J.). 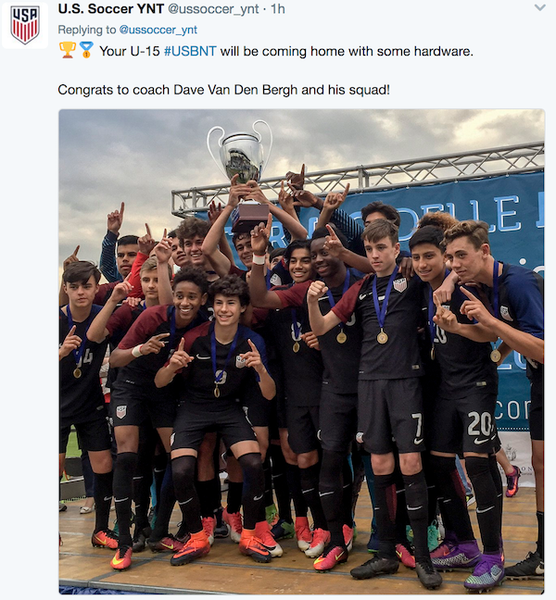 37 comments about "Gio Reyna, Claudio's son, leads U.S. U-15s to Italian title". Fire Paul Gardner Now, May 1, 2017 at 1:53 p.m. Uh oh, Kumar and company need to figure out some excuses. I guess everyone else sent their B teams, or C teams, or Z teams. We can't be happy about any potential progress. And no doubt QTD will weigh in lamenting that these kids missed a few days of classes. The Ghost of Gary Young replied, May 1, 2017 at 2:25 p.m.
Everybody left their best players at home. Brazil would have won this tournament with their 07s. I know guys who used to play in Brazil! Quarterback TD replied, May 2, 2017 at 9:11 a.m.
Quarterback TD replied, May 2, 2017 at 9:17 a.m.
Fire, some of these players will make good news for TMz in another 10 years when they are writing about young sports stars left penniless. This is a 3 weeks tournament and if one adds another week for training it's 4 week that a player has gone without school at 15 years old. Last week and this week are the AP test so I know none of these kids are doing any advance Curriculum test which means you may have border line students. Except for the Philly Union players none of these players should be granted this extended school leave to play in a tournament no one never heard. Where are the priorities on education ? I am guessing we don't have any.. there should be an investigation on this type of nonsense maybe some jail time for the coaches for taking kids out of school for this long. Fire Paul Gardner Now replied, May 2, 2017 at 9:39 a.m.
Did you ever hear of google? It is a website that allows you to search the internet quickly and efficiently so you don't post obvious falsehoods every single post. Quarterback TD replied, May 2, 2017 at 10:49 a.m. Sorry I use common sense over google something you seem to lack. My point being we are taking away education over a meaningless tournament. So I take it you, parents and USDA are selling these kids pipe dreams just to satisfy your thirst for the game. Simple question do you agree with this tournament regardless of the timeline during a critical period of the school year ? Fire Paul Gardner Now replied, May 2, 2017 at 11:22 a.m. So you make stuff up about the length of the tournament even when a 3 second google search will provide the correct information? Yes, I am fine with this tournament. The kids can keep up with school work during the trip and make up what they've missed later. It's no big deal. Most likely any of these kids who aren't good enough to make it as a pro when they graduate will get a college scholarship so playing is helping their education. Plus, the educational experience of travelling abroad is more valuable than another week in a high school classroom. These kids will be just fine. Quarterback TD replied, May 2, 2017 at 11:51 a.m.
Fire Paul Gardner Now replied, May 2, 2017 at 3:17 p.m. I googled AP exam dates and it seems like they could still make most of them. I do think that everyone good enough to be on this team will be good enough to get a D1 scholarship. If not, I doubt missing a week of school during their freshman or sophomore year will make any difference. In any event, do 15 year olds take AP exams? I thought that was for juniors and seniors. Fire Paul Gardner Now replied, May 2, 2017 at 3:18 p.m.
Also, google informs me there are makeup test dates later in the month. So they are fine. Quarterback TD replied, May 2, 2017 at 6:58 p.m.
AP is given from freshman so you may be typing AP incorrectly in google when doing your little investigations because obviously you don't know what these kids are up against. Also you choosing ignorance over education you are ignoring the fact that some of these kids can get injured, develope emotional pressure and stress trying to get back into the swing of things.. but what the hell you care ?? You still get to stay home and write blogs and watch soccer games in addition the coach can get another pool of players if 1,2,3 or maybe 4 fall at the wayside. The authorities definitely need to start investigating why these kids are being kept out of school for something that's not even important. USSF and USDA don't even support HS soccer but they abuse and break the education laws. This should be bought up to the respective school districts. It's an abuse of the school system. The Ghost of Gary Young replied, May 2, 2017 at 7:29 p.m. Absolutely correct, Quarterback. We should stop all youth activities. These kids are losing precious time playing when they should be listening to their teachers and reading books. And taking tests. Fire Paul Gardner Now replied, May 3, 2017 at 9:48 a.m.
LOL, yes missing a week of school surely dooms one's chances in life. According to this: http://apcentral.collegeboard.com/apc/public/repository/Appropriate-Grade-Levels-for-AP-Courses.pdf AP tests are generally given to juniors and seniors, i.e. not these kids. Plus there are makeup dates if they actually do miss a test. But I suppose your completely made up stories are more authoritative than published statements by the entity that actually administers AP exams. Quarterback TD replied, May 3, 2017 at 10:48 a.m.
Fire, I will laugh this one out because you are totally not connected to reality!!! AP test are given from Freshman but generally taken by Juniors and Seniors just like SAT and ACT.. there are quite a few test that freshmen take for AP if they meet those qualifications. Go and ask any blue ribbon public school guidance councelor instead off your one and only friend google. The makeup is a very time sensitive schedule and AP classes are college credit classes so it's not something that's easy to catch up.. you been in soccer for so long and still don't understand the sport so how do you expect a kid to miss out on a difficult subject for weeks and catch up ? Point is not AP but timing of these events during school year that takes away from a child education so unless you want a bunch of kids with limited capacity like you I strongly suggest you stop being ignorant to education. Fire Paul Gardner Now replied, May 3, 2017 at 11:34 a.m. This is silly. Kids miss classes and juggle priorities all the time. This is no different. Do you not think school was in session in the other countries that participated in this? C Buon, May 1, 2017 at 2:10 p.m. I believe it was Joseph Scally who scored first goal for USA ! Right Winger, May 1, 2017 at 3:13 p.m.
congrats to u!5's. We sent our National Team. Were the other teams national teams or club teams. I asked this before but no answer. Fire Paul Gardner Now replied, May 1, 2017 at 3:33 p.m. Unless there are "club teams" named England, Portugal, Russia and Slovenia, I would say it was national teams. But you knew that. Fire Paul Gardner Now replied, May 1, 2017 at 3:36 p.m.
Also, the name of the competition is literally "Tournament of Nations"
The Ghost of Gary Young replied, May 1, 2017 at 3:38 p.m. I agree, Fan. Not impressed! K Michael, May 1, 2017 at 3:51 p.m. Right Winger, May 1, 2017 at 4:24 p.m.
Fire you always talk with such authority. If you are right you are right. But if you will note this team and others have gone to several different tournaments on foreign soil and the teams have been identified as Spain, Croatia etc. and in fact they were club teams. I was simply asking a question. Fire simmer your Fire and if someone can give me an answer I would appreciate it. I hope they were National Teams because it will speak much better for our program. If not it is just another game. The name of the Tournament has nothing to do with what teams played in it only that the teams were from that particular country. Fire you become to defensive to quick. Clayton Davis, May 1, 2017 at 5:41 p.m. I'm not sure soccer America has the resources to be fully up on the u15 situation of all the countries in the world. I think it's hard enough for them to stay up to date on the situation in a vast country like the United States. Right Winger, May 1, 2017 at 9 p.m.
Allan Lindh, May 2, 2017 at 1:03 a.m.
Two things rule in young soccer players. 2. Being immersed in a soccer environment almost from birth. More young men and women who played competitive soccer having children who grow up in a soccer environment will have more impact on quality of play in this country than all the money and coaching falderah -- IMHO. Fire Paul Gardner Now replied, May 2, 2017 at 9:41 a.m.
Yep - totally agree. The more soccer becomes a part of our national culture, the quicker we will improve. The Ghost of Gary Young, May 2, 2017 at 11:20 a.m.
Quarterback is right! Throw them all in jail for going to a tournament!! I don't care if they did have tutors on the trip -- throw them in jail too! Fire Paul Gardner Now replied, May 2, 2017 at 11:23 a.m. Exactly. The really important thing is that everyone involved in this go to jail. Even the kids since they missed school. The Ghost of Gary Young replied, May 2, 2017 at 12:37 p.m. Right Winger, May 2, 2017 at 12:23 p.m.
Yep why send them to school when they have a chance to play MLS soccer. There they can make $50,000 to $100,000 a year for a couple of years and be set for the rest of their lives. Right? That is if the MLS team they are playing for doesn't have too many retirees from the international picture playing for them and sucking up their payroll. Also let me know when soccer becomes part of our national culture. It isn't going to happen in my life time. Wish it could but it ain't gonna happen. The Ghost of Gary Young replied, May 2, 2017 at 12:36 p.m. The Ghost of Gary Young replied, May 2, 2017 at 7:30 p.m. Right Winger, May 2, 2017 at 1:04 p.m.
We develop the best conditioned athletes in the world. The difference with soccer is the same tools(legs) that get you to the action are the same tools you use to execute the play. With that being said you have to be technically efficient to make them work at the same time in conjunction with the brain. No other major sport is like that. Golf might be close. What we have not improved on as fast as we should have is the technical side of the game. To be able to handle the ball under pressure. The ability to go one on one. Part of the reason is the coaching. There are many kids who have been left behind by the national teams who had tremendous technical ability but did not play the game damn the torpedoes full speed ahead. Our style of play at the younger ages is to move the ball forward and chase it as fast as you can. When push comes to shove this ain't going to work at the international competition. Watch a MLS game and tell me what you see. Fire Paul Gardner Now replied, May 2, 2017 at 3:20 p.m. Sounds like you copy and pasted that comment from 10 years ago. K Michael, May 3, 2017 at 11:13 a.m.
Fanfor, its all changing, the technical growth of our kids collectively is bounding forward. You are talking about the current crop of MLSers who were not born into soccer, but had 3 days a week training. The kids u17 and younger are organic born-with-it players, who at the highest level (and there are thousands in every age group)and have the same basic disposition towards soccer as any kid around the world - ball on their feet at an early age, playing all the time, watching the best live and on TV weekly, etc. Sure, you'll find gobs of kick-and-run but the sheer numbers of kids playing ensures legions of the high quality technical and athletic kids break thru. K Michael, May 3, 2017 at 11:16 a.m.
..and the DA system is not your "father's DA" or even better "your older brother's." It has changed so dramatically for the better that we are a mere decade from having a system that will stand shoulder to shoulder with the top academy systems around the world. Right Winger, May 3, 2017 at 2:13 p.m.
K Michael, I agree it is improving in some places and I know it will take time. The problem with time is that good talent gets left behind. I find a lot of technical talent out there but it isn't being utilized because the coaching even at the national level in the 14's, 15's and 16's lambast a kid if he touches the ball too much or attempts to be creative. I understand there are x amount of coaches committed to playing the game without tearing the cover off the ball and I know there are a lot of kids out there who are technically proficient and if left to play without the coaches filling their ears full of nonsense in the middle of play. When everyone gets moving in the right direction we will be fine. As far as being impressed with our progress and Improvement I am excited about it. One step at a time but until US Soccer actually oversees what they preach it is going to be a long time coming until we reach the plateau we want and need to be at. Just my thoughts.